Revolution and Evolution or Civil War? It’s a brand new world and using antiquated concepts of Conservatism as the moralistic, small government, promoter of big business, and Liberalism and Big Brother Government control of everything as the road to Progress will only lead you in circles. Now we have Progressives who are trying to convince people that a bicycle or no travel is a better way to live than having freedom of movement. We have “geniuses” whose idea of progress is to deny the reality of actual scientific data in favor of a Globalist pseudo-science that wants to kill off religion in order to control the world. However, they are still prepared to burn anyone at the stake who disagrees with their scientific absolutism as reality. “We’re in a war right now, not against Liberalism or Conservatism, but for the preservation of the world’s great Cultures and of humanity itself! This is represented by “Nationalism” against unipolar “Globalism”. “Globalism” is the New World Order, Deep State, police state, intelligence state, government within government, permanent shadow government and National Security State complex. We’re in a war against a Soros-backed, Bilderberg-backed, multi-layered conspiracy; involving dark and secretive forces, technologies, methodologies and anti-Terrestrial alliances that transcend anything from the past. Contra to “New Age” ascension theories touted by many globalists, Globalism, and a unipolar world, if fully implemented, as is intended, it will trigger the “final downfall of the human race”! We’re dealing with threats to our system that Reagan could not even fathom. He worried about the ‘Evil Empire’. That’s nothing compared to the Evil Empire being created by the Mockingbird Media right now? Their intentions are graphically evident as they endlessly repeat, regurgitate and dissect the myth that Trump and Putin allegedly conspired along with the Russia intelligence community, to deny Hillary Clinton her rightful place as Queen of the planet controlled by the New World Order! This myth is being presented through yellow journalism to remove the last two important barriers to the implementation of this dark Cabal’s worldwide control with one big fat Psyop called RussiaGate. Moreover they are getting away with it because of the lies of the MSM and the blatant censorship of Conservatives and Alternative News sites by the socialist media like Google, Facebook and Twitter. Hillary provided the Media with the basis, reasons and her excuse for losing the election and with that came this contrived and incredibly-orchestrated, machination and conspiracy to implicate Trump. As lies were being leaked by Trump’s adversaries, everything from Fusion GPS, to dossiers, to Russian hookers, to FISA Court requests, were all exposed as false. All of it totally unraveled. There was Rosenstein, Strzok, Comey, Orr, McCabe, Brennan, Clapper, Obama, Clinton and the DNC, and this monumental superstructure of corruption coming to light. People were fired, removed, demoted, transferred, clearances yanked, and careers jettisoned. SpyGate is way bigger than Watergate and the attempts at covering it up are massive and unprecedented! Finally we are exposed to the “anti-Trump Orchestra” and it’s profoundly corrupt but aptly qualified to cover-up another Deep State crime, “Conductor”, Robert Mueller, “The Cleaner”! The unravelling can no longer be suppressed and the corruption crosses all party lines, all races, all nationalities and both genders. It has to do with what was once called class warfare. Now we see the oppressor class being that of the Political Class, and the Robber Baron 1%, like the heads of the Socialist Media infrastructure of the Internet. Then we have the ABC Agencies, the Pharmaceutical Industry, Food, Water, Energy Sectors, the Media, Schools and Universities, and even the upper echelons of the Churches and Religious Movements of the world. The one thing that the oppressor class all have in common is the use of the power of government, which they removed or stole from the people and used to enrich themselves. What this “Criminal Class” of world controllers did not understand is that the people were ready for someone like Trump and had actually invited him to become the catalyst for change from what they had known and abhorred for far too long! For many, the “upper class”, especially the “political class”, have completely lost their legitimacy. The people have finally realized that those in charge are nothing more than a murdering mafia of world-class con artists who have proven that they are above the law and to whom the rules that they have manipulated through infiltration, subversion and fiat money will never apply. Trump gave those without a voice a chance to send a message that the upper class no longer exists in the minds of the awakened people because they have realized how much corruption and crime has been used against them while any merit is absent to explain the upper class’s rise to positions of power. Furthermore, the people of the world have been forced to confront the clash of civilizations promoted by the globalists. In doing so they have become well aware that government, rather than serving the human race, has been used to steal from most of humanity so that these oppressive tyrants could maintain their positions of power, influence, control and self-enrichment. Moreover, the media is covering all of it up! What we are really looking at is tighter and tighter centralization of power, resources and influence being created behind closed doors through non-stop crimes against humanity across the planet and behind our backs. This is being done to literally ensnare the human race into becoming domesticated slaves of the most Evil Empire that ever existed on this planet. The Right and the Left are encouraged to waste their time and energy arguing over whether it is moral to murder your unborn offspring. Liberals and Conservatives are literally coming to blows over whether an opposite or genderless or mixed sexual identity, against all known biological scientific reality, is a human right. We are being “divided and conquered by distraction”, while our basic human rights like clean water, clean air and un-poisoned food are being taken away from us. The Globalists have poisoned the Earth and infiltrated or created the majority of the pro human rights, pro-environment, sounding institutions. Furthermore, Globalists have fomented every war, every rebellion and every invasion in modern history! Liberals of the far left are being “mind controlled” while being urged to act upon implanted, Malthusian beliefs that overpopulation and Nationalism are the reasons for all of the world’s problems! Therefore, elite leftists like Bill Gates, Ted Turner and Prince Phillip have actually stated that the human race should be eradicated, while people like George Soros have said that Nationalism should be abolished. Moreover, the politics of the Left has been increasingly fueled by militancy, personal peeves, victimhood and the dehumanization of anyone who disagrees with them. Conservatives and Moderates are walking away in droves. www.walkawaycampaign.com. 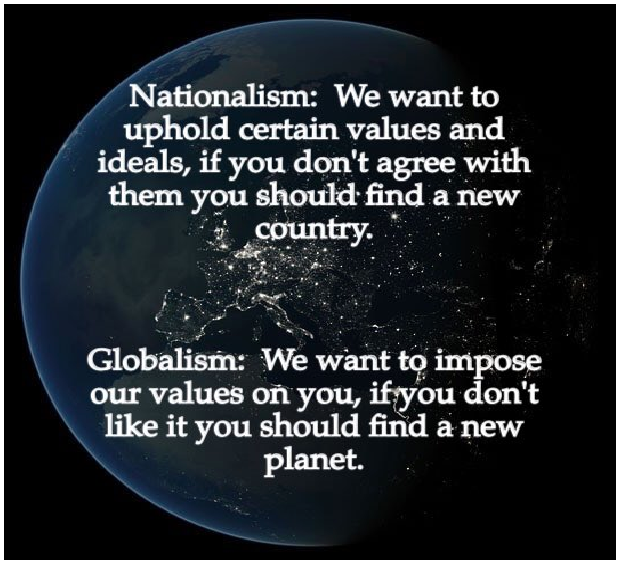 Globalism is a Trojan horse in the truest sense of the word and it exists in every country, international institution, NGOs, charities, human rights organizations and in the hearts of some very nihilistic and evil human beings. There is also the argument that maybe those who are involved at the highest levels are not actually human, since almost nothing else about them is authentic. The choice is simple: Freedom or Slavery. There is nothing “Pro” about Progressive. There is only “aggressive” and “unaware” which makes them very dangerous puppets who are being used as weapons against the rest of humanity. These people are helping the Globalists and working against their own interests as human beings. By the same token, there is nothing “Con” about today’s Conservatives who understand the existential threat that Globalism poses to our Nation, our States, our Communities and our very existence on Planet Earth.